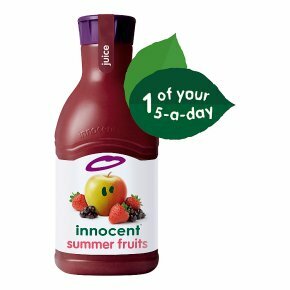 Innocent summer fruits juice is a blend of apple juice, white grape juice, crushed strawberries & crushed blackcurrants. Crisp apple, sweet strawberry and tangy blackcurrant all blended together to make a deliciously refreshing juice. - it's never concentrated - a blend of apples, grapes, strawberries and blackcurrants in every 1.35l carafe - 1 portion of fruit in every 150ml serving Our innocent promise: 1. Tasty healthy products* - 100% pure fruit juice. No concentrates. No funny business. 2. Sourced sustainably - we use recycled & recyclable packaging, refuse to air freight and source ethically. 3. 10% of profits go to charity - find out more at www.innocentfoundation.org Innocent drinks. Tastes good, does good. *This juice is a source of Vitamin C which contributes to the normal function of the immune system. Enjoy as part of a healthy lifestyle and balanced diet. PS Eat your greens.